Happy Friday! Today I’m sharing an easy, last minute gift for mom. Body scrubs are some of my favorite homemade beauty products to make. They’re fast and inexpensive but super effective, and they can take on all sorts of scents and looks. I prefer sugar scrubs over salt scrubs because I find the sugar to be a lot more gentle on my skin. Salt is way harsh on cuts and freshly shaved legs (I know that one from experience. OUCH! ), so sweet sugar is always my go to. I usually forego the essential oils in my personal sugar scrubs (out of laziness mostly), but because this is for mom, I suggest adding a little lemon essential oil for extra fragrance. 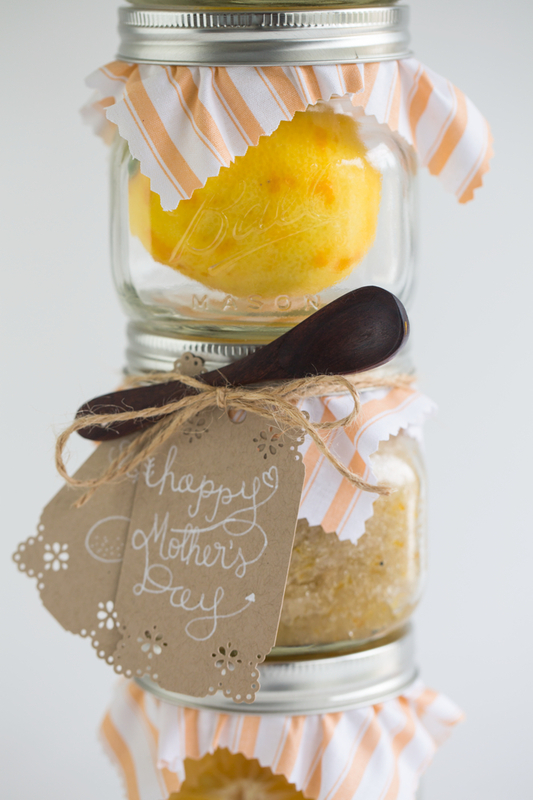 Put your scrub in a cute jar and attach a small wood spoon with twine and a note to make this gift extra special. I have two friends celebrating mother’s day for the first time this year so a very special Happy Mother’s Day to Melinda and Ashley! Love you guys (and your littles) to pieces. 2. Store in an air tight jar. 3. Tie a bow around it and give it to momma. Note: Because of the fresh lemon zest, I recommend refrigerating between uses. Spread liberally all over body and scrub gently to exfoliate. Rinse with warm water and pat dry. Skin should feel soft, supple, and fresh. Not recommend for faces, the amount of sugar in this scrub would be much too abrasive. NOTE: This scrub may leave your shower or tub slightly greasy from the oil. Rinse your space well to avoid slipping. Fights free radicals and pollutants to maintain younger looking skin. Enhances the clarity, glow and softness of the skin. Natural humectant, it helps hydrate the skin. Contains alpha hydroxy that keeps skin glowing and looking younger. Reblogged this on KP28 * Soul Food. a wonderful recipe and very inspiring and colorful images described both with 2 words…Love and Quality…thank you! Wow, that’s a wonderful gift for the most loveliest person on earth………. I’ve always wanted to try to make a homemade scrub. I think I will try this one! Can you make it without the vitamin e oil? What a great idea! Such beautiful packaging. Nice! I have been buying overpriced scrubs forever – did not know it was so easy! Also you take SUCH beautiful pictures! Thanks for this easy recipe. I attend food swaps and am all out of ideas – this will be great for the swap. Oooooo! I am going to try this! Superbe idée :) Je vais essayer ! What a cute gift! I’ll have to keep this in mind! Made this yesterday. Lots of fun! And Mom liked it.